Dental imagining software that helps practitioners deliver correct diagnoses and identify the correct treatment. CS Imaging Reviews Recently Reviewed! Comments: Carestream does have good support; Supporting bad software is almost as good as having no support. So a lot of customers must perceive that Carestream is lacking in support when in fact the software is really a Frankenstein Software with mish-mash of programing designed for Windows 1998 and XP. Its 2017 and Windows 10 is very different level of programming. Pros: The software carried us through for the past 10 years. Well programmed for its time. Uses Eclipse instead of SQL. Isn't Eclipse freeware? Cons: Buying new Server Hardware has its limits and can't compensate for Old programming. Some of the the .ddl are specific to windows XP? Poor Database - lag of 12 seconds? Google is freakin' faster and Carestream database is internal network. Complained about software issues since 2011 with no hope of Carestream forming a team to redevelop the Dental Imaging system When you start using the system, you learn too much about poor software via your tech complaining at least once a week. I fix teeth for a living and I know too much about why Carestream software has problems. So.... you really think you want to go to CbCt and digital impressions with Carestream? 12 second lag with 2D images..... Would you want to pay staff to wait 15-30min for an image? Pros: The definition of radiograghs is surperb. That is all I like about it. I think for definition it is better than dentrix. I have been a hygienist for 16+ years and I think for the quality of films it is definitely the best I have seen. It is nice that you can use the radiographic system apart from their software system as far as maintaining records. We use strictly the program only for images. We use digital software. 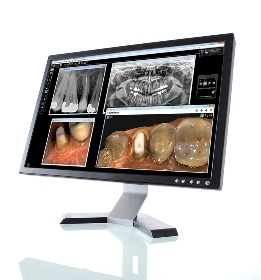 We capture Intra oral films, radiography with a sensor, panos, as well as 3D images. It is great for all of this. All of the images are very well defined. Cons: Kicks you out of program, customer service terrible and takes lots of time. Whenever you have a problem you have to call them and wait on the line as they try and figure out what the problem is. Pros: I think the customer support is outstanding, they will walk/talk you through any problem you may have. If that doesn't work, they'll remote in and get it figured out for you. Great group of people. Cons: Recently had to get a new sensor and it had to be installed by third party that does it for offices. First thing I was told was this would not be simple, because it never is with Carestream. They were correct. Thought it was done, wasn't, and turned around and came back before getting far away. Thought it was done again because Carestream had them go through the server. Didn't work for all computers. Install is coming back again so all computers can access the program. It's not a bad program, it's just not a great one. Comments: I highly recommend Orthotrac to anyone considering purchasing a new Ortho Software Program. I have been a user of Orthotrac for almost 20 years and they have successfully improved any of the deficiencies in the software. Pros: We are a very busy Orthodontic Office with ~ 40 computers running Orthotrac. The program is solid, we rarely need to contact support for any issues. When we do need support they are very willing to remotely connect to our system and solve any problems while we continue to treat patients. One of the most important things to me was finding a comprehensive software with a strong, efficient support department, which this company definitely has. The new charting module is amazing. Cons: Everything. It doesn't work Period! Overall: I used Softdent for 3 years along with Carestream/ Kodak Imaging and what a nightmare. The system would crash on a regular basis. The images would take up to 2 minutes to appear. 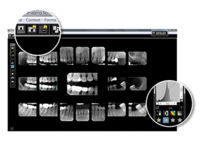 Carestream/Kodak Dental Imaging software should work together because they are from the same developer. They don't. Constant crashing and the Tech support would always blame the hardware. It was brand new hardware. I once had the hardware tech in the office when I called tech support. When they blamed the brand new hardware the hardware tech asked the Softdent Tech, show me the error code. The Softdent Tech couldn't. The Hardware Tech then told the Softdent Tech, "stop blaming the hardware for your poorly written software". At that point, they finally stopped blaming the brand new hardware. We had a dedicated imaging server, which was recommended by Softdent, then when I became so irate with tech support, they transferred all the imaging data to the main server, which didn't help. This was a start-up practice with relatively low amounts of data and a small database. I then demanded my money back for all the Carestream products, the intraoral sensors, intraoral camera, pano, extraoral camera, and software. I was put in contact with the VP of customer relations, who was very nice, and she said there was no return policy. She did send out a tech from Atlanta to Arizona and he was in my office for 3 days. He still couldn't get it to work right. The software is so piece milled together that each module has different icons for the same thing. The database was rebuilt multiple times. Good luck trying to care for patients, it was a full-time job getting the system to work right, which it never did, even though it was all from the same company. I do not know how they are still in business. If you have low blood pressure and would like to have high blood pressure or may be an aneurysm, buy Softdent. Pros: I like that you can dock patients to your staff members to communicate with them and that you can also leave alert notes in patient's account regarding financial, medical and personal information. Cons: what I least like about this software is that when you call to confirm appointments it doesn't allow you to specify how you confirmed it. Also, when posting patient's there is no way to show that you have already posted payment or procedures to their accounts. It'd be really helpful if they could maybe have a specific color theme for that so you can keep track and stay organized. Overall: I love that it's easy to learn and very practical. Pros: My favorite thing about the software would be how it gives me the option to have the patients date of birth printed out on the xray. This really helps identify who the xray belongs too as well as saves us a step of labeling it. Cons: My least favorite thing about the software would be that it is sometimes temperamental. I do not like that there are times when it will not allow me to flip a panoramic xray horizontally to view. This does not happen all the time but it does happen often enough. Overall: The software allows me to print out xrays in an efficient way for both myself and the Doctor. It allows for pertinent information to be printed out with the image that helps everyone working. Cons: The cost is atrocious. I am locked in thru a previous practice owner. Forever. No joke. Once every 2 years or so they supposedly update the software, but these changes are negligible. Also, trying to use this for chairside charting is not an option, the graphics on the odontogram look like an old Atari system. Pros: Easy to use and install. If your needing to call support someone is always there to help. If a call back is required they are very prompt with getting back to you. Cons: We are pretty happy with the overall working of the software. Maybe a small handful of times we have had to call support within a year, if that. Overall: the images that are being taken are clear and pop up fast, so we are able to show are patients right away. The overall flow of the program is well thought out. Comments: DO NOT BUY IT!!!!!!! Spend your money wisely. Get Eagle Soft or Dentrix. Stay away from this outdated system. I am switching ASAP!!!!!!!! Cons: Crashes very often, non compatible with major Antivirus. Expensive for tech support that covers only minor issues. Every feature is extra money for what you need: like e back up, perio charting, etc. Costumer Service is horrendous!!! They take forever to answer the call. They are always sorry, they transfer you to 10 people before someone can give you a straight answer if he or she knows what's going on. You spend 45 min to 1 hr to get you problem solved. If your lucky. System is not user friendly at all. When the Reps try to sell you the system they do not disclose all these "minor details". They tell you, you will love it for the price. My contract is indefinite. Is yours? If you want to cancel, there will be a penalty charge. Nobody has any idea of what's going on in this place. You get a different answer depending on who you talk to for the same issue you are trying to get resolved. Absolute "Garbage"!!!!!!! Cons: The software is incredibly SLOW. I recently updated all of my computers and server in the office and despite this, the program is painfully slow. If I could only get back the time I've spent watching that darn blue circle go around and around! The IT guy tells me that it has nothing to with my computers or server, it is the software. He does IT work for quite a few dental offices and tells me that he wouldn't recommend anybody purchase the software. He says it may have been a good product 8 years ago, but now there is much better, faster, more user friendly dental software on the market. FYI, this software came with an existing practice that I purchased. I wouldn't have chosen this software myself. Recommendations to other buyers: Do your homework and find a software that is USER FRIENDLY is fast. Pros: I like that you have quick keys on the keyboard, as well as the financial reports that you can generate for the practice. Cons: Sometimes it throws error codes that prevent you from saving a patient chart. Overall: My overall experience is great! I've been using the software for the last 5 years solid, and before that I used it on and off for 10 years. It is the dental software I found to be easiest to learn. 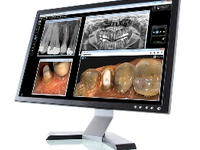 Pros: Carestream dental software seems to be fairly easy to use. They try to keep it very user friendly. Cons: I wish when you marked a patient "confirmed" that it gave the option of how it was confirmed. I've used other software in the past that has given a dropdown menu with items such as "left message w/ adult", "left message w/ child", "left message on voicemail" etc. Cons: Navigation is tricky and there is just so much to remember. Unable to integrate with our Web host. Overall: After years of using SoftDent, I finally thought I had it figured out. But along came an issue and could not find a solution in the Help section, had to contact customer service. Ended up changing software to a more user friendly, easier to navigate POS. Comments: I can't wait till Softdent rolls out its new iteration. Pros: It's the 2nd best software I have used, behind Dentrix. The support team is great, and it was easy for my team to use to make patient appointments and write clinical notes. Cons: The system is outdated. It is not intuitive. I am a millennial/Gen X, and am used to tech that is simple and easy to use. Imaging quality great and easy to use! Pros: The ease of loading photos and exporting images easy. With the help of technicians, we were able to load our logo so any images are branded with our office. Software easy to customize! Cons: I would like comparison photos to expand larger and exporting photos without having to make them PDF files. Comments: Kodak product origionally-- high priced-- they sold it to care stream at a premium. Pros: I like how easy the software is to use. If i need to change the contrast of an image it guides you step by step. It is also to easy to take an image. Cons: Software is wonderful. there is nothing i did not like. Overall: I am able to diagnosis issue's with patient's dental needs more than I can with a regular x-ray. Pros: there is really nothing about this software that i like that isn't available with all the other software out there. Pros: The software is very user friendly. It works quickly and accurately to get clear images. It is compatible with Dentrix, Planet DDS, and Eaglesoft systems. Cons: There are some technical bugs sometimes where the software freezes while trying to capture an image. Overall it doesn't happen too often. Pros: User friendly, very efficient. Excellent reports and continues to grow. Was created with Dentists giving valuable advise. Cons: Don't communicate with their clients enough. Their should be more Carestream to Dental Office interaction. Untruthful, Poor customer support, DOES NOT INTEGRATE WITH DEXIS!! Pros: Long time users of Softdent with few problems, but the latest update does not allow the program to integrate and they claim that they can do nothing about the issue. Cons: We have used Softdent for more than 10 years and have been "alright" with the program. The latest update that we downloaded caused the program to no longer integrate with Dexis which it always has and they claim that it will. The update had been out for 6 months but at first they claimed that we were the only office that they had had this glitch with. 3 weeks later they have admitted that the program will not integrate with Dexis and they can not fix the issue even though every update for the last ten years has integrated with Dexis. They state they will not help any more with this issue. Overall: Horrible customer service, Completely dishonest (still states that there program integrates with Dexis) while it does not. Use any other dental software program except SoftDent! Please feel free to call me to find out more about my experience with this program if you would like! Pros: It is very user friendly now, however we are wanting to go chartless and it doesn't seem like it will be very efficient program to use once we do. Cons: It is the SLOWEST program EVER with the spinning circle of death anytime you try and complete a patient. Pros: It is very user friendly once you know what your doing. Cons: The software is capable of so much that it is sometimes difficult to know which reports to run that are the most beneficial to your practice. Pros: There have been a few good support people. Cons: Support, I think many work from home, need to request Level 2 tech, I don't have time for level one trying to figure things out. Software is extremely slow so as our practice grew it had become extremely frustrating, we then added the Faircom server to speed up process which it did HOWEVER Faircom is a glass slipper and CRASHES if it isn't perfect conditions. We need to replace our 2012 server but we have to replace with another 2012 because Softdent isn't compatible with the most recent server! We also use E-forms on the iPads we just did an update on iPads to 11 and now eforms no longer work because it isn't compatible, I am told they are working on it... seems to me the developers would be forward thinking on development and not a step behind. Time to move out of the dinosaur age. After struggling with this for 14 years we are looking for a change. Softdent is a sinking ship, horrible support and myriad problems. Pros: This software is cheaper than the other big names in dental practice management software. It works best on Windows XP (yep, you heard that right). Cons: Softdent has tons of problems. First, if you are using Windows 7 with Server 2012, you'll see all kinds of slowness. You can help it by installing some hotfixes, disabling SMB, LLMNR, and a few other things, but this only speeds it up marginally. Older computers actually run this software faster. When you do need support, Carestream hold times can be upwards of an hour. There are other network drops that happen somewhat frequently. They released a big product update that they later cancelled due to problems, then released another version which didn't solve speed problems. Comments: Care stream is my go to software for beautiful images. You can see the the entire mouth of the patient very clearly. Easy to use and affordable! Cons: It was a little to simple for me. I would have preferred a software that had more options to do a little more complex treatment planning and note taking. However, it has been several years since I have used it so I would hope that it has upgraded some. Overall: Software does not support multi-tasking, always have to back out of what I'm doing in order to get to another area of the program. Multiple people cannot access the patients chart at the same time. Old & outdated look & functionality. Pros: Easy to use, no power needed, light weight, no tower attached, you can use it in every compatible computer. Pros: none. its use to be good, and over the years, the updates have completely corrupted the program and they refuse or are unable to debug it. Cons: Support has gotten worse and worse. There are long wait times for support. Their accounts receivable department hounds you if you are a day late with their payment. Sales promised me not to bill me for e-prescribing until I used the program , then started billing me with no notice even though I have never used their e-prescribing module. Recommendations to other buyers: Stay away. It looks like the company is trying to cut expenses by cutting back on support. Cons: Crashes at least once a day, trying to get a solution and guess what? Useless. I will be able to give cons when the situation is fixed meanwhile this program is just a disaster. Do not buy this "software"
Pros: I like the box it comes in and the "features" it is advertised as having. Cons: It break constantly just for like no reason and support acts like that is normal. It is like if you bought a new car and it broke down every day and the dealer said "well you drove it faster than 15 miles an hour so that is really on you"
Overall: Softdent is a horribly broken non functional pile of garbage. We have used this program for years now, it has never worked correctly and breaks on a weekly(sometimes daily basis) the fix is always to reindex the database which takes 3 hours in the middle of the day where no one can use the software. It has been like this for two years with us having to go down at least once a week to "fix the database" we have tried moving to a new network and new server entirely but the problems persist. Softdent has horrible error checking, uses a weird proprietary database back end that does not work at all. This program is not even close to ready for production and their support is a huge embarrassing joke. I will be surprised if the company even exists in a year. Recommendations to other buyers: Do not buy it for any reason and if anyone suggests it to you you should punch them in the face. the most unreliable poorly constructed digital sensors. Comments: Customer service is also generally terrible. Unable to keep up with records (had to show them my transactions, claiming we had no replacements in 5 years) and very anxious to nickel and dim fee you at every chance. Pros: not a single thing. I generally dislike all aspects of your product and wish I hadn't inherited it. Cons: to big - other products much better in design replace constantly terrible quality- have replaced 3 sensors 2 times in two years - paying well over 3k each time. The warranty does not reset apparently even though its a new sensor? Comments: We are an Oral Surgery office and went live with WinOMS on December of 2016 after using Windent for 17 years. Our experience with Customer Support has been terrible! Wait times to get to a Level 1 tech can take upwards of 30 minutes on average, to as much as an hour, and generally requires them to "escalate" the call to a Level 2 tech because they do not have the ability to solve the problem. The Level 2 techs are not available to the calling customer but rather are reached by the Level 1 tech via emailing only. If you are confused, wait, there's more! Once your issue is raised to a level 2 tech it can take an undetermined amount of time for them to solve your problem, requiring you to call back just to see where you stand with a resolution. Had I known this would never have purchased this system. STAY CLEAR OF THIS COMPANY!! YOU'VE BEEN WARNED!! Carestream is a great program for viewing images. Pros: I like the ease of use of the software. The interface is simple and easy to navigate through without difficulty. Cons: To see some of the 3D images I would like to the software would require a very expensive graphics card. This is cost prohibitive. Comments: Do not buy it! Cons: Their lack of commitment top their product!! After it was installed there was NO follow up visit from rep. No Training from CS. Comments: COMPANY HAS NO SUPPORT, WAITING TIME 30 MIN TO 1 HOUR AND MORE, STAY AWAY. Recommendations to other buyers: DON'T BUY IT. The worse software for a dental practice I have ever used. Pros: Can't think of a thing. It is not user friendly at all. There are so many steps involved in even the easiest of tasks. Cons: Where do I begin? It's not Dentrix or Eaglesoft. To get training is so overpriced that I am having to learn on my own and it is just not a system that is useful.